How to make your own bellydance costumes, harems, hipbelts, bras, turbans, gypsy style, and tribal costumes. Author - Dawn Devine, aka Davina, is the internationally acclaimed author of Costuming from the Hip, a guide to designing and making belly dance costumes. She owns and runs her own independent publishing company, Ibexa Press, a growing firm with a backlist of eight titles and more on the way. In 2002 the company shipped over 2,400 pieces worldwide. Her most recent book, Embellished Bras, is a step-by-step guide to building costume bras for dance performance. A few of her other titles include From Turban to Toe Ring, Bedlah, Baubles and Beads and Style File ). (Other booklets include: Skirting the Issues and Pants for the Dance. Historian - With a B.A. in Art History, Dawn has combined her love of art and costume history to produce her M.A. thesis. She worked as a lecturer, presenting such topics as Fashion and Impressionism, Safavid Splendor - Persian Motifs in Textiles and Miniature Art and her own original M.A. thesis work From High Art to High Fashion: Aesthetic Movement and Queen Magazine. She has worked on several costume exhibits including From Bustles to Bikinis at the San Diego Historical Society Museum. In addition, she has worked as a research assistant to other authors and was pleased to contribute to the book California Couture, by Maureen Reilly. She has lectured extensively on Victorian costuming through the Old Sacramento Living History Center and has presented her work at the Costume Society of America Symposium. Her current publications focus on research into the history of Middle Eastern costume. Costumer - Dawn has been sewing professionally since 1985. After receiving an A.A. in Fashion Design and a B.A. in Art History from the University of California at San Diego, she went on to work for four seasons at the La Jolla Playhouse in the costume shop. In 1995, she moved to Northern California for graduate school at UC Davis, where she completed her coursework in Art History and spent a year in the design M.F.A. program. Along with her professional career, she has enjoyed making costumes for fun, participating in hundreds of costume shows at conventions throughout California. She continues to design and sew wearable art, dance costumes and historical pieces for herself and clients. Dancer - With a lifelong love of dance and expressive movement, Dawn discovered belly dance as a teenager and hasn't looked back. Under the professional dance name Davina, Dawn has been performing since the mid 80s and teaching since the early 90s. She has performed in numerous restaurants throughout California in San Diego, Los Angeles, Sacramento, San Jose and Reno and at dance festivals such as Rakkasah and Desert Dance Festival. She teaches dance classes and performance workshops in her own contemporary fusion style that integrates the stylistic features of Egyptian, Lebanese and Turkish technique and builds on her classical dance training. With over eighteen years of performance experience, she is an in-demand judge for belly dance contests such as Wiggles of the West in Reno, Nevada, and Double Crown in Portland, Oregon. This is the best selling book available on belly dance costume. Costuming from the Hip is an introduction and overview of Middle Eastern costume design. The book is an informative guide to the wide variety of costume styles worn within the dance community, along with directions for design and construction of many styles. If you don't know where to begin in the world of belly dance style, Costuming from the Hip is an excellent introduction. Tribal is a tremendously popular dance and costuming style. From Turban to Toe Ring was written with the tribal costuming enthusiast in mind. This book introduces the principles of tribal costuming and goes over how to create a stunning tribal costuming. From selecting jewelry, to making costume pieces, tying a turban and using henna, this book has it all. This book explores the various layers and elements that compose the tribal style costume. From jewelry and cosmetics to cholis, skirts, and pants, this book is loaded with directions for designing and making the garments described in this book. With over 300 illustrations and diagrams, this book is an essential addition to the reference libraries of costumers, teachers and tribal styles dancers. Not just for tribal costumers, this book contains costume parts and pieces that can be used to make ensembles suitable for dancers who just want a more folkloric, historical, fusion or Gypsy look. Spiral Bound, 96 pp. The latest book, Embellished Bras, is based on the popular "Stuff and Fluff" workshops and is our first publication that uses detailed step-by-step approach using photographs to illustrate each step of the bra making process. This technique uses a store-bought lingerie bra to create a gorgeous costume piece. From selecting the bra to making a pattern for the cover and applying it, all the construction techniques are covered in great detail. This “workshop in a book” demonstrates the techniques for transforming a lingerie bra into a beautiful finished costume piece. This easy-to-follow four-phase process is presented through graphic step-by-step photographs and illustrations. From simple sewing techniques to numerous design examples, this workshop in a book is an excellent resource for novice sewers and professional designers alike. Softbound, 64 pp. Have you ever been confused by all of the specialized te rms used to describe belly Middle Eastern dance costume? Then this is the book for you! Style File is a visual glossary of dance costume styles that are hot on the dance scene today. Each major stylistic grouping is presented with gorgeous drawings, with supporting text that provides information on where the style originated, who wears it and the dance style rely on these styles for their distinctive look. 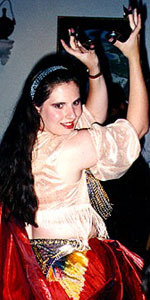 The skirt is one of the most essential elements of a belly dance costume. But, did you know that skirts are one of the easiest costume pieces to make? This bo oklet provides instructions for making all skirts using your own body measurments to draft custom patterns. From the classic 3-panel circle skirt to the tiered tribal style skirts, the basics are all in here. But if you are ready to let your inner designer loose, there are directions for gored skirts, godet skirts, panel skirts, straight skirts and more. Skirts are an important garment type for dancers no matter what style of costume they choose. This booklet is filled with design ideas that go beyond the standard “three panel” skirt. From gores to godets, tiers to panels, this booklet includes directions for turning your body measurements into patterns customized to your figure. Softbound, 48 pp. If you've ever wondered if there are more pant styles than the basic harem? In this booklet, we've pulled together a collection of ethnic and modern styles designed with the dancer in mind. Each style is presented with detailed directions for taking your body measurements, using them to make a pattern and constructing pants that are designed specifically for you! This booklet addresses the exiting design possibilities for one of the most ubiquitous but unsung garments in the dancer’s wardrobe: pants! This book introduces a simple method for using body measurements to draft patterns that fit. Go beyond the basic harem style and explore a variety of options for creating pants for male and female dancers alike. Softbound, 40 pp.